Enormous, overstuffed sandwiches that are synonymous with NYC. 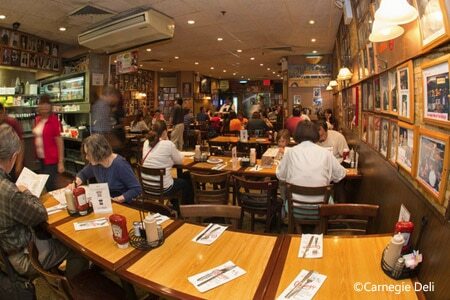 : A Theater District landmark, the Carnegie has cramped tables, big crowds, wisecracking waiters, and high prices, but it's still one of the best places to get top-quality (and lean) corned beef and pastrami, enormous overstuffed sandwiches and real New York deli ambience. Take home what you can't finish for another meal. We know many out-of-towners who make a beeline here the minute they set foot in Manhattan---even if it is 2 a.m.